Other Names: Dr. Feel Good, Taylor Made Man(WCW), Terrance Taylor(WCW), Red Rooster(WWF), "Terrible", "Scary", "Terrific"
- Georgia National Tag Team Title Tournament (November 27, '80) = Taylor & Steve Keirn beat Jerry Roberts & Steve O, then fell to the eventual winners, the Freebirds (Gordy & Roberts). - Mid-South Superdome Extravaganza (April 7, '84) = Taylor won, via DQ, over Butch Reed. - Mid-South Superdome Extravaganza (June 16, '84) = Taylor won the Mid-South Television Title, beating Krusher Khruschev. 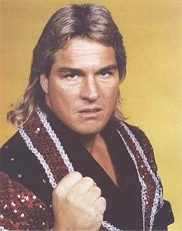 - Mid-South Superdome Extravaganza (March 30, '85) = Taylor retained the Mid-South North American Heavyweight Title, winning, via DQ, over Kamala. - Mid-South Superdome Extravaganza (June 1, '85) = Taylor lost to the NWA World Heavyweight Champion, Ric Flair. - NWA Starrcade '85 (November 28) = Taylor lost the National Heavyweight Title to Buddy Landel. - NWA 1st Annual Jim Crockett,Sr. Memorial Tag-Team Tournament Cup (April 19, '86) = Taylor & Steve Williams defeated Bill Dundee & Buddy Landell and Dino Bravo & Rick Martel before fighting to a Draw with Ivan & Nikita Koloff. The Road Warriors won the tournament. - Mid-South Superdome Extravaganza (June 14, '86) = Taylor stayed the Mid-South Television Champion, taking down Buzz Sawyer. - Mid-South Superdome Extravaganza (November 27, '86) = Taylor won a "Barbed Wire Steel Cage" Match over Buddy Roberts. - Mid-South UWF Tag-Team Title Tournament (February 7, '87) = Taylor & Sam Houston defeated Terry Gordy & The Angel of Death, then lost to Rick Steiner & Sting. Later on, Taylor replaced Iceman Parsons as Chris Adams' partner, with the duo beating Steiner & Sting in the finals. - Mid-South Superdome Extravaganza (April 11, '87) = Taylor & Chris Adams retained the UWF Tag-Team Titles, beating Rick Steiner & Sting. - Mid-South Superdome Extravaganza (August 1, '87) = Taylor pinned Steve Cox. - NWA Starrcade '87 (November 26) = Taylor lost the UWF Television Title to Nikita Koloff, who unified the belt with the NWA Television Title. - WCCW 5th Von Erich Memorial Parade of Champions (May 8, '88) = Taylor stayed the WCCW Texas Heavyweight Champion, beating Chris Adams. - WWF Wrestlefest '88 (July 31) = Taylor lost to Curt Hennig. - WWF King of the Ring Tournament '88 (October 16) = Taylor defeated Marty Jannetty and Mike Sharpe, then fell to Randy Savage. Ted DiBiase won the tournament. - WWF Survivor Series '88 (November 24) = The Red Rooster, Ted DiBiase, Haku, & the Twin Towers fought in an "Elimination" Match against Hulk Hogan, Randy Savage, Hillbilly Jim, Koko B. Ware, & Hercules. The Rooster was eliminated by Hogan, who 'survived' along with Savage. - WWF Saturday Night's Main Event #19 (December 7, '88) = The Red Rooster fell to Tito Santana. 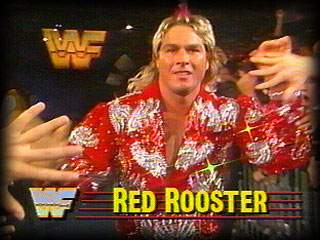 - WWF Royal Rumble '89 (January 15) = The Red Rooster competed in the Royal Rumble, which was won by Big John Studd. - WWF Saturday Night's Main Event #20 (February 16, '89) = The Red Rooster defeated the Brooklyn Brawler. - WWF Wrestlemania V (April 2, '89) = The Red Rooster won over Bobby Heenan. - WWF Summerslam '89 (August 28) = The Red Rooster was beaten by Mr. Perfect. - WWF King of the Ring Tournament '89 (October 14) = The Red Rooster lost in the first round to Haku. Tito Santana won the tournament. - WWF Saturday Night's Main Event #24 (October 31, '89) = The Red Rooster again lost to Mr. Perfect. - WWF Survivor Series '89 (November 23) = The Dream Team (The Red Rooster, Brutus Beefcake, Dusty Rhodes, & Tito Santana) fought in an "Elimination" Match against the Enforcers (The Big Boss Man, Bad News Brown, Rick Martel, & the Honkytonk Man. The Rooster was eliminated by the Boss Man. Beefcake & Rhodes 'survived'. - WWF Royal Rumble '90 (January 21) = The Red Rooster competed in the Royal Rumble, which was won by Hulk Hogan. - NWA Clash of the Champions XII (September 5, '90) = Taylor & Jackie Fulton fell to the Nasty Boys. - NWA Halloween Havoc '90 (October 27) = Taylor beat Bill Irwin. - NWA Starrcade '90 (December 16) = Taylor lost to Michael Wallstreet. - WCW Clash of the Champions XIV (January 30, '91) = Taylor took down Ricky Morton. - WCW WrestleWar '91 (February 24) = Taylor won a "No Disqualification" Match over Tom Zenk. - WCW Superbrawl I (May 19, '91) = Terrance Taylor was pinned by Dustin Rhodes. - WCW Clash of the Champions XV (June 14, '91) = Terrance Taylor lost, via DQ, to Dustin Rhodes. - WCW Great American Bash '91 (July 14) = Terrance Taylor & Steve Austin lost a "Scaffold" Match to Bobby Eaton & PN News. - WCW World Tag Team Title Tournament (July/September '91) = The York Foundation (Terrance Taylor & Richard Morton) lost in the first round to Todd Champion & Firebreaker Chip. Arn Anderson & Larry Zbyzsko won the tournament. - WCW Clash of the Champions XVI (September 5, '91) = Terrance Taylor competed in a Battle Royal, which was won by El Gigante. Later on, Taylor was pinned by Van Hammer. - WCW Halloween Havoc '91 (October 27) = Terrance Taylor lost to Bobby Eaton. - WCW Starrcade '91 (December 29) = Terrance Taylor & Tom Zenk were beaten by Arn Anderson & Lex Luger. - WCW Clash of the Champions XVIII (January 21, '92) = Terry Taylor & Tracey Smothers lost to Marcus Bagwell & Brian Pillman. - WCW Superbrawl II (February 29, '92) = Taylor fell to Marcus Bagwell. - WCW WrestleWar '92 (May 17) = Taylor & Greg Valentine lost the WCW United States Tag-Team Titles to the Freebirds (Gordy & Hayes). - WCW Beach Blast '92 (June 20) = Taylor was pinned by Ron Simmons. - NJPW Sumo Hall (August 10, '92) = Taylor fell to Kensuke Sasaki. - WWF Royal Rumble '93 (January 24) = The Red Rooster competed in the Royal Rumble, which was won by Yokozuna. - WWF European Rampage (April 25, '93) = In a dark match, Taylor won over Virgil. - WCW Starrcade '93 (December 27) = In a dark match, Taylor beat the Equalizer. - WCW Superbrawl IV (February 20, '94) = Taylor pinned Diamond Dallas Page. - HWA 2nd Annual Pillman Memorial Show (May 19, '99) = Taylor took down Tom Pritchard. - HWA 4th Annual Pillman Memorial Show (August 9, '01) = Taylor defeated Bobby Eaton. Ricky Steamboat was the special referee. - NWA-TNA PPV (Show #62, September 24, '03) = Taylor beat Kid Kash.